Jasmine (genus Jasminum) is a tropical plant that is has over 200 species native mostly to Asia, Africa and Europe. For growing in the United States, jasmine plants will grow hardy in zones 9 to 11. Jasmine grows as a woody shrub, trailer or climber, producing delightfully scented white flowers. If you care for your Jasmine plant correctly, it will grow up to 2 feet (60 cm) each year. Jasmine is a fairly flexible plant when it comes to sun and soil. It can flourish in full sun or partial shade, and it can be planted in well-draining sandy loam or considerably clayey garden soil. Jasmine plants should get plenty of sun, but they should be kept out of direct mid-day sun if possible. Working compost like moldy leaves into the soil and fertilizing lightly once a year in the spring is helpful. If growing indoors, make sure that Jasmine receives at least 4 hours in a window where it gets full sunlight in the winter. Because of their fast growth, make sure you space Jasmine bushes out considerably. Plant Jasmine from June to November, with at least 8 feet (2.4 m) of spacing between bushes. For indoor container planting, start in the autumn. Young plants may need support from staking. Jasmine will not survive frosty cold weather. Keep air temperatures between 50 and 78 degrees Fahrenheit (10 and 25 degrees Celsius); better yet, maintain air temperature between 60 and 75 degrees (15 and 24 degrees Celsius). 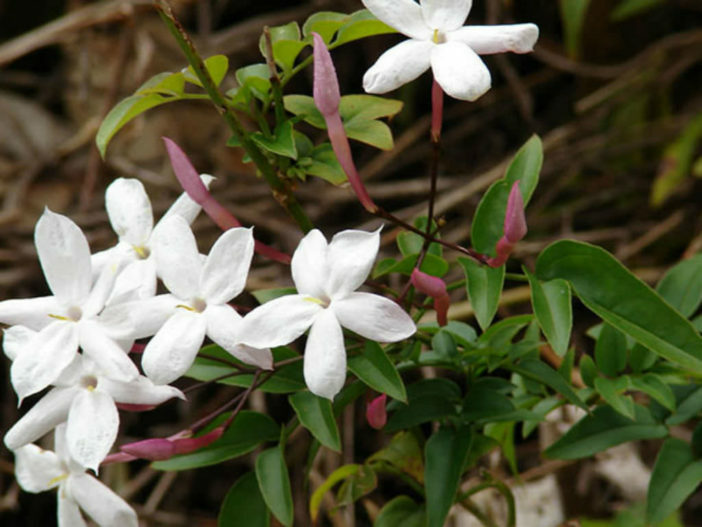 Fertilize Jasmine with fertilizer higher in potassium and phosphorus than nitrogen. Fertilize after a heaving pruning and again in June. Fertilize more often if Jasmine isn’t producing much growth or flowers, but no more often then bi-weekly. Water Jasmine plants immediately after planting. Water weekly or whenever the top inch (2.5 cm) of soil dries out until the plant is fully established. Leaves may fade to yellow or brown if soil is too dry or too moist. Most jasmine plants grow between 10 to 15 feet (3 to 5 m) high and 3 to 6 feet (0.9 to 1.8 m) wide. Pinch off new blooms and shoots from spring through August to encourage more growth, especially sideways. If your Jasmine plant is growing too large, prune it down to desired size. Cutting down the entire plant to half its size each spring will help keep Jasmine growing tight and full, and it will encourage a higher number of blossoms. Most Jasmine plants will begin blooming in January (cut down to half size after blooming stops). If growing Jasmine vine as a ground cover, prune off any vertical growth. Jasmine are most easily propagated by cutting off branch ends with at least 2 or 3 sets of leaves, pulling off the bottom set of leaves and planting in a pot with dampened peat moss. To retain a moisture-rich environment, cover the pot with a sheet of plastic, tying to down to create a tent shape. Keep at around 65 degrees Fahrenheit (18 degrees Celsius) and in a well-lighted area, but out of direct sunlight.